The Standen UniPlus Destoner models use a combination of Star and Web technology for maximum stone and clod separation. The combination of Star and UnderWeb technology is designed to offer the most thorough separation for all growers, whatever the soil type. 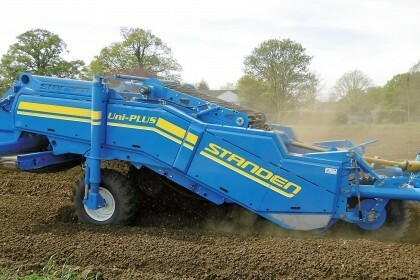 For growers operating on lighter soils, the Web only version of the Standen UniPlus Destoner is ideal if the focus is solely on stone separation. a heavy duty V Belt drive capable of transmitting high power loadings with improved efficiency and a significant built-in safety margin. The machine is set at slightly inclined operational angle which enhances performance with an increased axle steering angle to improve manoeuvrability. Standen UniPlus Destoner models are available in 1700mm or 1500mm working widths, with the option of; a hydraulically activated boulder box, reversible VariFlow Scrubber Web for enhanced clod breakdown and downhill operation as well as a hydraulic breakaway drawbar. If you require more information please don't hesitate to contact us.